As the high school football and volleyball seasons wind down the inevitable truth becomes a reality for more teams...there can only be one champion! Every season starts with the excitement of possibility, promise and hope only to give way to the inevitable reality of competition, goals are either attained or they are not. I believe it is this finality that makes sports so alluring. The other reality of team sports is that it takes a team to win. While the age old adage is true that there is no "I" in team, there is also truth in the fact that a team is only as good as the weakest player. Teams will set their goals but the reality is that the success of the team will come down to each players individual commitment to improve themselves. Champions are not created during the season or during the scheduled practices, they are created by daily deliberate discipline and determination. Improvements will come slowly and only maximized through the compounding interest of consistency. The first step in the process of maximizing athletic potential is an honest assessment of all aspects of performance. While some aspects of performance are the obvious focus, specifically skill, speed, strength and power there is an overlooked yet vital piece of the puzzle. The one thing that can destroy all attempts at improving performance in an instant is injury. Yet, every year athletes suffer a variety of injuries during the season but give them little to no attention after the season. Athletes jump back into offseason training regimes or move on to the next sport without completely resolving the injuries that they have sustained. The human body has an incredible ability to compensate for injury in one area by utilizing secondary muscles. A friend of mine with 30 years of experience in athletic training coined the phrase "continue your rehab until your weakness becomes your strength" and yet laments the fact that year after year athletes will rehab an injury only until they return to participating then abandon the program. Not completing the rehab process and fully recovering range of motion and strength ratios is simply setting up the body for future injury. The body is a kinetic chain and just like any chain is only as strong as the weakest link. Sports by their very nature place extreme levels of stress and strain on the body repeatedly. Once an injury has occurred not only is there the initial tissue damage but there is an immediate onset the compensation pattern. In response to the injury some muscles become inhibited or weak and other muscles spasm to protect the joint. These initial responses lead to changes in joint alignment or posture which then changes the mechanics of the joint. These changes can be subtle and overlooked especially when the initial pain and disability of the original injury reduce and yet they remain. Thus, the first step of any offseason training should focus on resolution of these patterns, including specific stretching or strengthening to reduce the compensation patterns. The subtle aspect of sports training is overlooked by most athletes as they are focused on increasing strength, speed and skill. Hours are spent running, lifting, and practicing skill only to be negated when the injury reemerges or the new stresses of the compensation pattern create a new overuse injury. The premise of "Periodization" in sports training is to break the year into smaller progressive training cycles which build on each other to have the athlete in optimal condition at the onset of the next season. Lack of planning or skipping phases will decrease the effectiveness of the overall program. The first phase or "corrective" phase is the most vital component of the process but the most likely to be skipped. If a the body is only as strong as its weakest link and a team is only as strong as its weakest player then maybe we are missing the most important part of preparing athletes. We are the Champions! The grand culmination of each sports season! Players and Coaches rush the field in celebration of reaching this elusive goal as the fans go crazy! There is nothing like the feeling of becoming a champion and yet it is a feeling that very few ever experience. The reason it is so valuable lies in how rare it is. Only one team gets the title each year, the unbridled joy from one team is a stark contrast to the pain of the other. With the end of every sports season comes the reflection of successes and failures. While the champions are holding up the trophy and celebrating all the other teams are left wondering ‘what it’ and attention quickly shifts to setting goals for next season and the all too familiar "Just wait 'til next year!" I think Alan Armstrong’s quote sums it up well “Champions do not become champions when they win the event, but in the hours, weeks, months and years they spend preparing for it. The victorious performance itself is merely the demonstration of their championship character.” As with everything in life, nothing worth having ever comes easy. While every athlete and coach longs to hold the trophy and be recognized as the best in their sport, the real truth is that very few are willing to put in what’s necessary to reach that level of success. Every team starts the year with high hopes and expectations of success and everyone ‘works hard’ so what separates champions from everyone else? Further, why do some programs become dynasties and others perennial losers? Champions are outliers by the very definition of the word. In his book of the same name Malcom Gladwell spins a hypothesis of what makes outliers and it is applicable to what makes Champions. Gladwell postulates that outliers separate not only because the sheer amount of practice they do compared with contemporaries, but the also the type of practice. While most are satisfied just putting in the required amount of practice, Outliers put in significantly more. In order to be world class at something, the author leans on the 10,000 hour rule. In other words it takes 10,000 hours of dedicated practice to become world class at some skill or roughly daily practice for 10 years. What separates the great from the really good is the type of practice. The ‘Great’ tend to utilize daily deliberate practice. Instead of just going through the motion of practice for the allotted time, the ‘Great’ focus on improving their weaknesses. The only way this is possible is through complete awareness of what the weaknesses are! Therefore, they need a systematic approach of gaging their performance and identifying their strengths and weaknesses and then having a logical plan to improve. This requires an objective coach(s) to help with the assessment and planning but then comes the hardest part the daily deliberate discipline to make the improvements. Daily deliberate practice is hard because it is a journey without end; the goal is mastery not a destination. The determination, grit and energy it takes to maintain this methodical march over several years is what separates the really good from the great and the great from the Champions. The overall plan must include not only the initial evaluation but then systematic reevaluations to show improvement to help refine the process. This is one area where the ‘instant gratification’ mentality is very detrimental because there is no short cut. Over the years we’ve seen the emergence and evolution of Sports Training or Performance Enhancement. Following the diffusion of innovation curve we’ve witnesses the early innovators leading the way with new training techniques specific to athletes. Then, the early adopters spread the ideas to more people and now we’ve reached the early mass phase where every professional team and most colleges have strength and conditioning coaches. Spreading from the professional and collegiate ranks there has been a steady increase in businesses offering a variety of sports training and performance enhancement services. As with all professions there are the great, the good, the not-so-good and the horrible. If you are an athlete or the parent of an athlete and your goal is to maximize your athletic abilities how do you decide the right program? The Truth about the Road Less Taken! A very famous poem that is often sited and referenced especially in business and entrepreneurship but the truth is that it is not that simple. The decision to take the "road less traveled" isn't a one time decision. It is a decision that occurs repeatedly. My personal experience has shown that the more times you take "the road less traveled" the more difficult and lonely the travel becomes. The vast majority of people simply can't comprehend taking a path of uncertainty, unknown difficulty and loneliness over the well trodden path of the masses. The path of uncertainty takes tremendous courage and grit, not to mention the intellectual ability to solve unforeseen problems with creativity and possibly limited resources. The critics will be plentiful, mocking and jeering for they only know what they perceive as reality. They don't understand that the "reality" they preach is simply an illusion of their own creation. Possibility and opportunity lay in the realm of the unknown and unexplored. Taking "The road less traveled" is extremely taxing, mentally, emotionally and even physically and thus the need for tremendous energy, determination and grit. Once again I find myself at the choice of two roads. One is security and relying on what has already been built. To become a settler and enjoy the fruits of past labor. An enticing chance to sit back and relax. A chance for a 'well deserved' rest. The other is to explore the new possibilities and to push the limits of my intellectual, emotional, spiritual and physical abilities. What Frost failed to mention in his poem is the chorus of family, friends, and advisors who for various reasons champion the well traveled path. 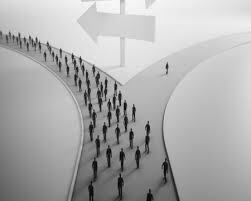 Having just emerged from the last "road less traveled" complete with ample amounts of criticism, rejection, mockery and judgmental opinion maybe it is time to fall in line with the expectation of the banks, pundits, advisors and champions of the road well traveled. On the day of my judgment when I stand before God and he asks me "What did you do with what I gave you?" Will I tell him that I went part of the way? That I accomplished quite a bit but then gave in to 'conventional wisdom' and took the well traveled road? That it became to difficult to continue? That I was tired of fighting against others who demanded security above everything else? That I was tired of being the only one on the path? Only to hear his reply..."you didn't believe that I was always with you?" No, I'd much rather hear "Well done my good and faithful servant." The Road less traveled it is!" Foster your Pioneer Spirit to Explore, Discover & Align Possibility, Passion and Purpose!